Please note that because I prepare customized cleansing and conditioning treatments, I conduct a free initial consultation and scalp analysis prior to beginning the service for every first-time client. This will add approximately 30 minutes to your first service at REVIVE! a hair spa. Every client, new and returning, receives a scalp analysis prior to their service. Revive the natural health of your hair with the power of water! the MicroMist Spa treatment enhances hydration by using ultrasonic vibrations to emit an enormous quantity of microscopic water particles (mist) that penetrate deeply into the hair. The MicroMist‘s two-step process begins by releasing a warm mist to activate the blood’s circulation, open the hair’s follicles and cuticle layers and allowing microparticles of oxygen, water and our customized conditioning treatments to permeate inside the hair’s cortex, followed by a cooling mist to close the cuticle layers, sealing in essential nutrients and moisture. This treatment will leave your hair visibly smoother and softer. 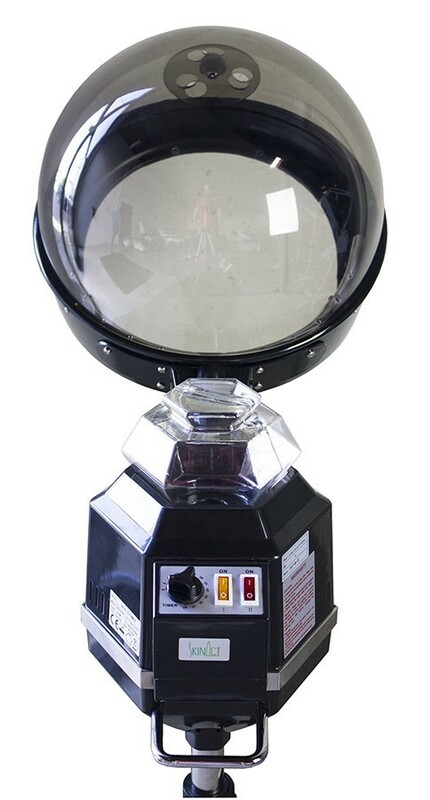 this hooded steam treatment maximizes any process or conditioning treatment. 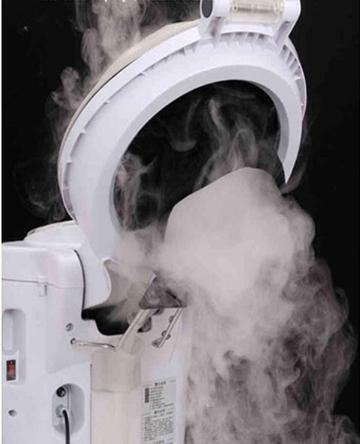 Steam, which is generated from heat lifts the hair cuticle allowing water particles and our customized conditioning treatments to penetrate deeply into the hair shaft. Steaming aids in hydrating hair leaving parched tresses replenished. The moist heat also increases collagen production and encourages blood flow to circulate, promoting hair growth! Additionally, steaming helps to release toxins from the scalp. an invigorating scalp scrub made with sugars, herbs and essential oils that remove dead skin cells, excess oil and impurities, while improving circulation. Removes build up at the hair follicle opening and beneath so that bacteria can be flushed. Includes hooded steam treatment. a customized hair masque that hydrates and replenishes the hair with essential proteins, amino acids and humectants. This deep penetrating conditioning formula is blended with organic Milk and fresh Aloe Vera restoring texture, body, elasticity and manageability. Recommended for low porosity tresses, when holding onto moisture is not the issue but getting it in is. Includes shampoo and MicroMist spa treatment. a luxurious combination of reparative ingredients formulated with Vitamins A and E and blended with fresh Honey, Yogurt and Jojoba Oil this treatment helps repair damage by conditioning and providing hair with basic essential nutrients, reducing breakage and split ends, restoring flexibility and shine to dull tresses. Recommended for low porosity tresses. Includes shampoo and MicroMist spa treatment. This specialized strengthening treatment reinforces the protein structure of your hair. It repairs damage, improving elasticity, strength, curl, and bounce by replacing the vital elements that hair loses during chemical processes and thermal styling. Substantive proteins bond with hair working to eliminate shedding and reducing breakage. Includes shampoo and MicroMist spa treatment. The first step is a deep penetrating protein conditioner formulated with Omega-6, Omega-9 Fatty Acids and Magnesium which meld into the hair with the application of heat. Sitting under a hooded dryer, (indirect heat), the blended treatment will harden the hair. The second step is a power-packed moisturizing treatment formulated with Potassium, Vitamin B and Shea Butter promoting hair growth and elasticity while improving shine and texture. Highly recommended for high porosity tresses that are weak, limp, and lifeless, lacking elasticity, break when combed or brushed, and for tresses that are mushy when wet and/or brittle after drying. When the issue is not getting the moisture in but keeping it in. Also suggested for medium/normal porosity tresses, as a preventative treatment, to prevent damage, split ends and breakage. this hair masque powered by fresh proteins and butters mitigates damage to help patch breaches in the cuticle and strengthens heat damaged and over-processed hair caused by chemical perms, coloring or sunlight, leaving hair hydrated and protected. Recommended for high porosity tresses. Includes shampoo and hooded steam treatment. this deep penetrating treatment is a concentrated blend of Keratin, Amino Acids, Botanical Oils, and Vitamins. Blended with fresh Avocados and Rosemary, REJUVENATE! does wonders to nourish your hair and scalp, promoting healthy hair growth and providing your hair with long-lasting and deep hydration, thereby strengthening hair strands and length retention. Recommended for medium/normal porosity tresses. Includes shampoo and MicroMist spa treatment. this restructuring treatment blended with Vitamin E and Silk Amino Acid packs an amazing punch for returning proper moisture and protein levels to the hair. This intense, nourishing formula rehydrates dry, frizzy, and chemically treated hair adding silky body and shine. After just one use your hair will spring back to life usually much better than before. Recommended for low and medium/normal porosity tresses. Includes shampoo and thermal conditioning treatment. restores gloss and manageability to hair as well as relief from dry scalp. Blended with fresh Avocado and loaded with Essential Fatty Acids, skin healing and hair conditioning properties. Recommended for medium/normal porosity tresses. Includes shampoo and hooded steam treatment. this non-invasive scalp treatment using an Oxygen gun delivers pure Oxygen to the deepest layer of the hair root, allowing the scalp to get the oxygen it needs to regenerate. Enhancing blood circulation to assist in the penetration and absorption of nourishing ingredients. This calming and soothing treatment for the scalp, using pure Oxygen improves blood circulation and increasesOxygen supply to the hair follicles promoting healthy metabolism and hair regrowth. Suitable for all hair types and especially recommended for those suffering from hair loss, hair thinning, dandruff, oily scalp, sensitive itchy scalp and dry skin. this High Frequency Treatment using an electrical current stimulates blood circulation with an added germicidal action. The electrical energy helps disrupt enzymes that cause dormancy in the follicle and break up flaky build up. The treatment also helps increase circulation in the scalp to aid in faster growing hair. NOTE: This treatment should not be used on clients who have metal implants, a pacemaker (or any heart condition); epilepsy; open or broken skin (including wounds or new scars); or are pregnant. *These are not full services and do not include the REPLENISH! treatment, which can be added for an additional cost. NOTE: Prices are the minimum cost for the service listed. Final cost, usually, depends on hair length and comb out. Prices are in US dollars and subject to change without notice. Please note that I currently accept cash-only payments. Visit the REVIVE! Policies page for more information.